B) including the moment of inertia of balls. In the first part of the task we neglect the moment of inertia of balls – in such a case, is it possible to replace the balls with simpler physical concept? If we neglect the moment of inertia of balls, it is possible to replace balls with point masses. Draw a free body diagram and choose an appropriate reference frame. What does it mean „determine the motion of the centre of mass“? What should be the output of the task? The figure bellow shows the appropriate reference frame used in this problem. We consider that the motion is situated in the plane xy, thus we can omit the change of z-coordinate. The output of the task should be a formula which describes the change in coordinates of the centre of mass xT a yT, with time, xT(t) = ?, yT(t) = ? respectively. Assume that the balls roll down without friction. What accelerations do the balls experience? Draw a picture and mark all forces that affect the balls and find the accelerations, using the Newton’s second law. What type of motion is exhibited by single balls (in term of trajectory and velocity)? The force of gravity and the normal force of the surface act on both balls. Their resultant causes the ball of mass m1 to accelerate in xdirection and the ball of mass m2 to accelerate in y direction. 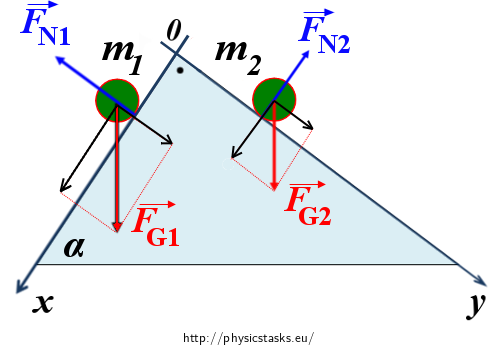 The figure bellow shows not only the acting force of gravity FG and normal force FN but also the components of the force of gravity aligned with the coordinate axes (in black). The ball of mass m1 undergoes uniformly accelerated motion in the direction of the x axis and with the acceleration a1. In the case of the second ball we proceed analogically. Write down expressions for x and y coordinates of the ball of mass m1 as a function of time. Proceed the same way for the ball of mass m2. At this point, we already know the way of changing the coordinates of our two balls (point masses) with time. Use then the formula that determines the coordinates of the centre of mass and solve the first part of the task. where mi are masses of individual point masses and ri are their respective position vectors. 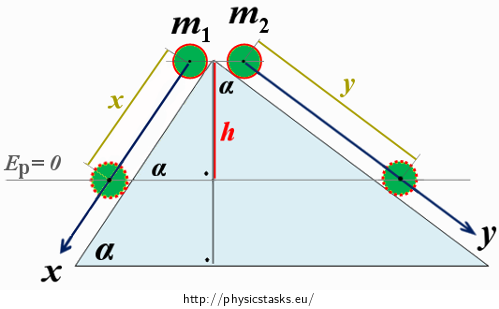 In the second part of the task we include the moment of inertia of balls. Firstly, go through the solution of the part A and decide how far it is replicable – where the non-zero moment of inertia is relevant for the first time? We choose a frame of reference analogously, there is only difference that the both axes are parallel with the surface of the inclined planes in distance R from it - that way we can accomplish that y-coordinate of the first ball and x-coordinate of the second ball are zero during the motion (see the figure). The non-zero moment of inertia J of balls will play its role, when we calculate an acceleration in each coordinate direction. Part of potential energy of ball Ep is converted into rotational kinetic energy Er during the motion on inclined plane, thus less energy can be converted into translational kinetic energy of ball Ek.The ball is moving then with smaller acceleration than in the case of neglecting the moment of inertia. We choose two situations and describe whole mechanic energy the balls have. The reference point of zero potential energy is set in depthhbelow the point of the release (see the figure above). where Ep1 is potential energy of the ball of mass m1. where Er1is rotational kinetic energy of the ball of mass m1 respect to axis passing through its centre and Ek1 is translational kinetic energy. where vx is velocity of the centre of mass of ball, J is the moment of inertia about an axis through ball’s centre and ω1 is its angular velocity. Analogously we can proceed also in the case of the second ball of mass m2, only the function sine is replaced by function cosine in the calculation of the hight h.
where vy is the velocity of the centre of mass of the ball, J is the moment of inertia about an axis through ball’s centre and a ω2 is its angular velocity. 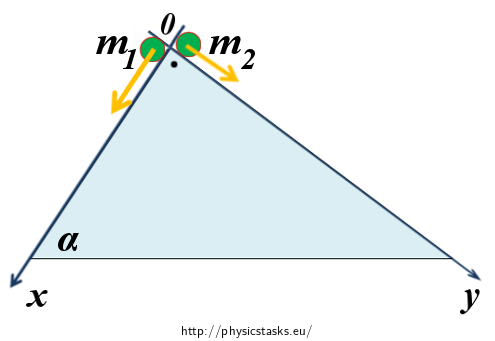 A magnitude of acceleration of the centre of mass of both balls can be determined also with different technique, and it is with the help of the laws of conservation of momentum and angular momentum. In previous step we obtained the magnitude of acceleration of the centre of the first ball ax and the second ball ay. Use them as components a1 and a2 in the part A and determine the change of coordinates xT´(t), yT´(t) of the centre of mass of the system with time using the same computation method. If we neglect the moment of inertia of balls, it is possible to replace balls with point masses. The figure bellow shows the appropriate reference frame used in this problem. Use the law of conservation of energy to determine an acceleration of the centre of mass of balls in each coordinate direction. The solution makes sense only for such t until the one of the balls touches the horizontal surface.